This is a Mt. Hood landscape print from an original watercolor done by me, Bonnie White. This artwork is hand signed on the front. It is printed on Epson matte paper using Epson Clarion inks. The detail and color are very much like the original painting. The 5x7 print is matted to 8x10 and the 8x10 is matted to 11x14. The mats are hand-cut white mats and include a backing board. They are in a clear plastic cover. The 13x19 print is not matted and comes rolled. Choose your size by going to the SELECT A SIZE box above the ADD TO CART button. 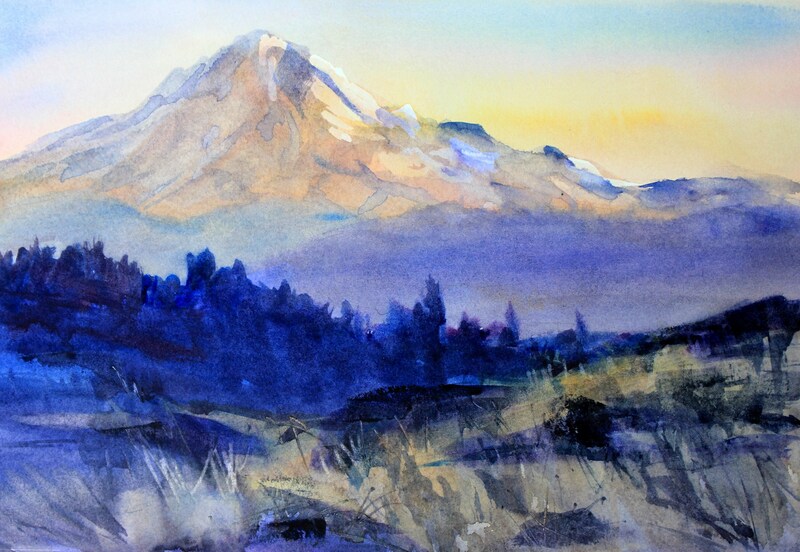 I am an established, award winning artist living in the Columbia River Gorge area of the western United States. I paint what I know and love, local birds, wildlife, farm animals, pets and landscapes. I believe that art transforms the space in which it hangs and, like music, sets the tone of your living space. Everyone should be able to afford and be surrounded by art they love.